Historic Larimer County, the Wellington Chamber of Commerce and the Wellington Main Streets Program co-hosted a walking tour of historic downtown Wellington on Saturday morning, June 30th. It was a very well attended tour (at one point I counted 85 people!) and included a wide range of ages. Ron Sladek, president of Historic Larimer County and the author of an intensive study into the history of the buildings in downtown Wellington, lead the tour. The best part of the tour was discovering that buildings that at first glance looked rather unremarkable, were in fact important places in the history of Wellington. The first such building that we came across in the tour was probably also the most unexpected. Wellington got its start in 1902 and was incorporated in 1905. Though a collection of homesteaders, farmers, and ranchers had lived in the area for almost half a century, there was no community center. It wasn’t until a train spur was brought from Fort Collins up into the area (in order to collect beets from nearby farms and take them back to the sugar processing plant in Fort Collins) that the town got its start. An excellent opportunity to start a blacksmith shop at once at the town of Wellington. The North Poudre Irrigation Co will offer special inducements to a competent, responsible man. Enquire of E. J. Gregory. The only historic photo that seems to exist of the shop is from Arlene Ahlbrandt’s book History of Wellington, Colorado and the Boxelder Valley, 1864-1996. 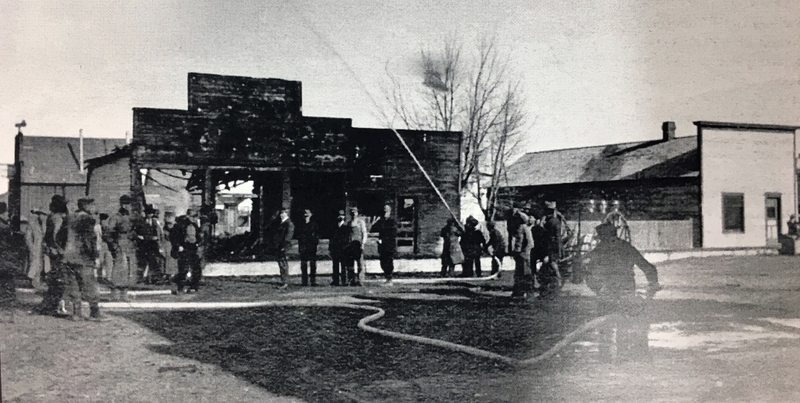 Image from Arlene Ahlbrandt’s book History of Wellington, Colorado and the Boxelder Valley, 1864-1996. Behind the fire, jutting out to the left, is what appears to be the blacksmith shop before the outside was covered in corrugated metal. The blacksmith shop was the second commercial building constructed in Wellington. The first was a small mercantile business originally run by E. P. Montgomery. 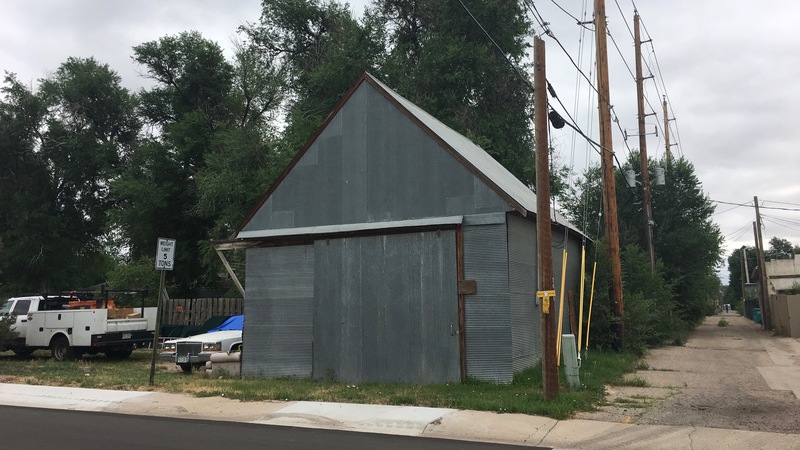 With that mercantile building now gone, that leaves the blacksmith shop, now apparently being used as a garage for a nearby residence, as the earliest remaining commercial building in the town of Wellington. Though the building might not be much to look at today, it still has a story to tell about the humble beginnings of the town of Wellington. 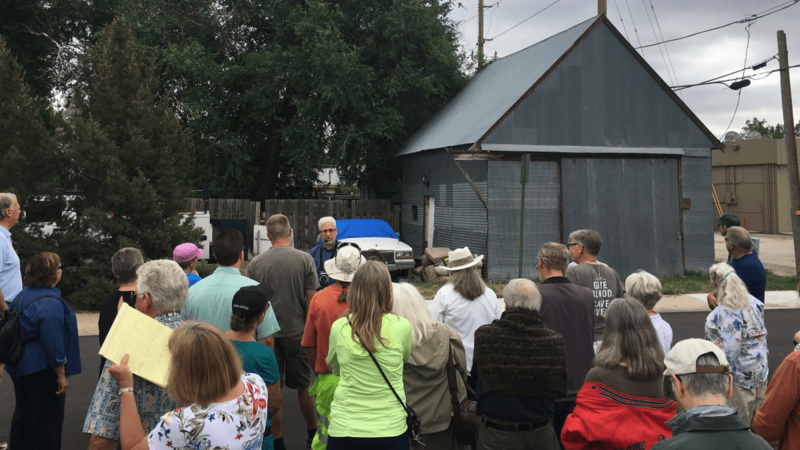 If you’d like to be sure not to miss future tours hosted by Historic Larimer County, consider becoming a member today (or at the very least, sign up to receive their bi-monthly newsletter). If you’re bummed that you missed the tour on Saturday and would like to encourage the Chamber of Commerce to hold it again, you may want to contact them through their website.